The playbill identifies Kevin Armento and Bryony Lavery as the authors of Balls, but the play was developed in a collaborative workshop in Houston last year. Lavery, who’s British, is a 2004 Tony nominee for the psychological thriller Frozen (a drama that predates the Disney musical). Armento, an American, is author of Please Excuse My Dear Aunt Sally, a much-buzzed-about tale of digital age intrigue. Alex J. Gould as the Ballboy and Elisha Mudly as the Ballgirl in Balls. Top: Ellen Tamaki as Billie and Donald Corren as Bobby. It’s impossible to judge from seeing Balls or reading the script just what Lavery and Armento brought to their first encounter with the workshop members. But it’s clear that the vaudevillian shenanigans now on view at 59E59 couldn’t all have been cooked up on a word processor. The energetic company uses sketches, songs, dance routines, comedic shtick, soliloquies, and abundant mime to dramatize both the showdown and the evolution of the liberation movements that roiled American civic life in the second half of the 20th century. In addition to chronicling the tennis match, Balls portrays King’s relationship with her husband, Larry (Dante Jeanfelix), and her lover, Marilyn (Zakiya Iman Markland), who lives and travels with the Kings, claiming to be the tennis star’s assistant. The play also tells the story of two Houstonians (Alex J. Gould and Elisha Mudly), a ball boy and ball girl at the big match who marry and, later, take advantage of the growing social acceptance of divorce to go separate ways in a world remodeled by women’s liberation. 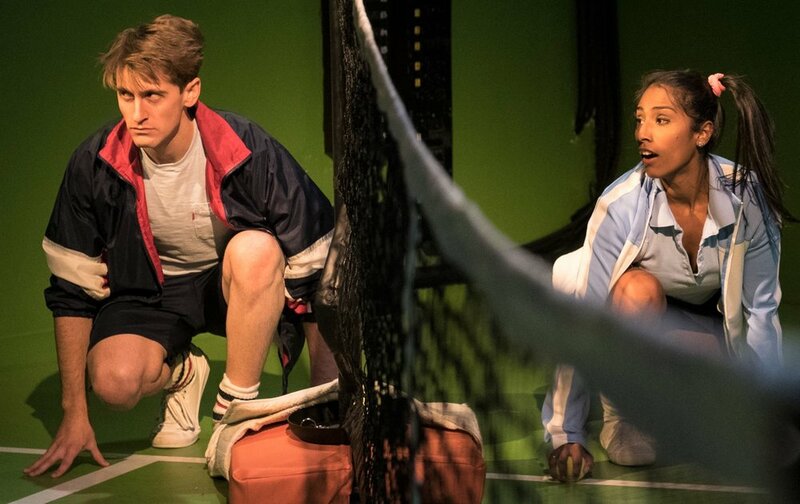 Another subplot concerns tennis “superfans,” twins Terry (Donny Bernardy) and Cherry (Cristina Pitter), whose dialogue reflects middle-class enthusiasms and prejudices. Richard Saudek as Clownboy and Olivia McGiff as Clowngirl. Photographs by Russ Rowland. Set designer Kristen Robinson employs movable scenery to make the limited space seem much larger, while co-directors Ianthe Demos and Nick Flint and movement director Natalie Lomonte keep the action at high velocity, using the balcony and auditorium for action as well. Mike Riggs’s lighting design effectively follows the play’s constantly changing mood and the multiple forms of narrative. The costumes by Kenisha Kelly and the sound design of Brendan Aanes evoke both the awful and the sublime of the 1970s. A pair of multipurpose clowns, played with verve and versatility by Olivia McGiff and Richard Saudek, usher the action from relatively realistic scenes to fanciful segments that serve as commentary on the tennis players, their era and ours. The clowns are an effective touch borrowed from Oh, What a Lovely War!, the groundbreaking reassessment of World War I created by English director Joan Littlewood and her Theatre Workshop in the early 1960s. As portrayed here, Riggs (Donald Corren) and King (Ellen Tamaki) view the world form radically different perspectives and represent sharply conflicting values. Tamaki with Dante Jeanfelix (background) as Larry King. Photos: Russ Rowland. Had it not been for Riggs’s challenge and the match, King might be known merely as one of the most capable athletes of her generation. On that night, however, she became a heroine—perhaps the heroine—of second-wave feminism. And with a profile so high, she couldn’t evade becoming a symbol on several fronts. A powerful force in the development of women’s tennis, she represented women’s professional sports in general. Because she had had an abortion when that procedure was still unlawful, she became a poster child for the movement behind Roe v. Wade, the 1973 decision of the U.S. Supreme Court that is the foundation of contemporary reproductive rights. Years after the Riggs match, when sued for “palimony” by the woman who claimed to be her longtime lover, King became an unwitting actor in the emerging drama of gay rights. Balls asks how society has changed since the unsavory display at the Astrodome and whether the changes are for better or worse. Some answers may be evident, but the actors don’t ram them home. Mindful of recent disclosures regarding outrages to civil liberty, including sexual misconduct and coverup, playgoers may find Balls disheartening, but their spirits will be buoyed by the energy and resourcefulness of this highly theatrical escapade. Balls runs through Feb. 25 in Theater A at 59E59 (59 East 59th Street). Evening performances are at 7 p.m. Tuesday through Saturday; matinees are at 2 p.m. Saturday and Sunday. For tickets and information, call Ticket Central (212-279-4200) or visit 59e59.org.